Getting rid of fleas on your cat is actually a multifold process. Not only do you need to kill the fleas on your pet, you need to prevent the eggs from hatching and reinfesting them. Flea eggs can fall into your carpet and thus require special treatment there as well. As will your yard if the pet spends time outside. This page offers suggestions for getting rid of fleas on cats. I've got a 5 week old orphaned kitten. She didn't appear to have fleas at first but as I was bathing her, I noticed fleas going into her ear. They were too fast for me to catch. Would a flea remedy work even if the fleas go into her ears? USE olive oil for any kitten no matter what age. Use a lot! Leave it on a couple of hours, you don't have to rinse it off, if there is no mom to lick it clean, you can rub with a towel, fleas can't breath..gets rid of lice and ticks too. Start with inside the ears first and avoid eyes and mouth. DO NOT ADD any essential oils like cedar or tea tree or peppermint. these can cause pneumonia or seizures and ultimately death. Olive oil doesn't burn and leaves coat and skin healthy. Treat mom's who lick kittens clean with piperazine (worm remedy easily purchased at any retail store. however NEVER treat already ill cats with wormer! CDC recommends this olive oil treatment for humans with head lice as some lice is resistant to commercial chemical preparations sold over the counter! I have 3 cats, one of which is a kitten, and my house is infested with fleas horribly. How can I get rid of these annoying things and get my babies flea free? Please help. I have tried *everything* under the sun, but I'll post what actually worked once I discovered my dogs had fleas. As others have posted, you have to treat the pet(s) and the home at the same time. 3 - If you have carpet or old haedwood floors with large cracks or spaces, purchase *very important* Food Grade Diatomaceous Earth (DE) which you can purchase at online nursery stores. I live in the N.E. area so I had to order it online. Sprinkle it generously on carpets and the floors - it has the same texture as cooking flour so it can get messy but it is made of fossil sea shells which cut and then dehydrates the exoskeleton of fleas and cuts their eggs. It's equivalent to us walking on razor blades. It was the only thing that worked! 3 - While in treatment, put 1 tsp. of cider vinegar in the drinking bowls and keep the bowls fresh. 5 - I don't like to use Advantage, etc., due to possible side effects and it's essentially a Pesticide. If you must resort to use, I would recommend Frontline instead. My cat has had fleas for ages and I have spent a fortune on treatment for my cat and surroundings. I am getting fed up of it now. I don't know quite what to do. I have had the powder for carpets, sprays, tried Frontline on my cat, pills, you name it, I have tried it. Any advice please? The only product that will kill creeping, crawling, jumping, biting, etc. with out harming pets and people, when I say that I literally mean you can mix in chicken feed, dog food, etc. Is .....drum roll...diatomaceous earth(fresh water, food grade). It is completely natural, used as anti caking in cat litter & farmer's grain, mixed with feed for livestock and other farm animals to keep bugs out. Bonus; the flies die after landing in their poo! It's even used in pool filters as a medium. You can find at tractor supply, feed stores, online, and it is very cost effective! empty a large baby powder bottle and fill with DE (as it is referred to) using a funnel, pop the lid on close holes most of the way shake, squeeze upright to make a fine cloud that will coat & kill! Or use a medication syringe to apply into cracks and tiny holes. I dust my window sills and after a fly comes in I find it dead in under two hours! It was discovered by Mr. Nobel (like the prize!) that the fossilized shells from a hard-shelled algae called a diatom stabilized nitroglycerin for storage and travel. (that helped out with the name). Later came the anti-caking factor and then the slug killing factor, and on and on. Try NOT to inhale it, tobacco is natural but we see how well that is going! You should try to wear gloves (I don't but my hands look like the elbows of a 190 lb 'outside dog') it will make your hands very very dry if left on, or at least wash them often. Keep it in dry storage. Read the bag. Super bonus - Even after you vacuum or sweep there will be a light coating which is all that's needed to be safe for all, but the un-wanted. I am a college student having terrible trouble with fleas in my home! I live in an old house with 3 others and we each have our own cat. We now have fleas and have had them for about 2 months. We have treated the animals twice and finally purchased a prescription pill to kill the fleas on the cats. We have also used borax around our house, a vet recommended pesticide spray and we just bombed our house. I am looking for any other tips or tricks I could use to ensure the fleas are gone. Maybe a cheap homemade spray I could spray around my house? Something that won't harm my baby. Thank you! She said she never needed to spray after that. Vacuum thoroughly daily and flea bomb. What is the best flea remedy for cats? A "Best Remedy" is almost impossible as the (cat, dog, etc.) flea is one of the most abundant and widespread species on Earth. Below is an answer I provided to another very recent question about how to deal with just about any type of flea out there. As you will see, the flea has a special life and you and your pet are invited! My husband is an entomologist so I speak with first hand knowlege and experience. Flea eggs do not stay on your pet, they quickly drop or roll off as they do not stick to anything. The fleas you find in your house are from the flea eggs that fell off of your pet. Flea eggs are opaque white or almost colorless. What you may see on your dog are immature fleas from eggs on the floor or outside that hatch into fleas and jump back onto your dog. You will also see (many!) small black dots on your dog but these are only flea poop. The flea eggs in your home and outside are the real problem. Just one female flea can produce 40-50 eggs per day. The eggs fall off and into your house or outside so, either way, your dog will then again attract the immature and adult fleas from their flea parents that may still be living on your dog. Any dish detergent bath may kill the fleas on your dog, however, you can seriously dry the skin and may cause skin rashes, cause an allergic reaction, etc. and you are not addressing the real problem. The thousands of flea eggs that are still in your house and outside hatch and jump back onto your dog (and you!). So, you and your dog are locked into an everlasting cycle in the life of fleas. I have two cats. We spray about ever two days for fleas. Nothing is working. We do have a flea collar on them. Would Epsom salt work as the same as plain salt? Fleas are so hard to get rid of! They could be sand fleas coming in with the cats from outdoors, but they will hatch out in the house in carpet, bedding, and upholstery. 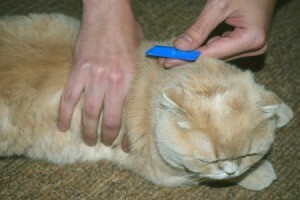 The best way to control fleas is to start a dedicated programme that includes very frequent vacuuming of hatching favoured areas, spraying or dusting the house with a flea-rid product making sure to read and follow the directions to the letter, and of course preventive measures on the pets. My kittens are 13 weeks old and were spayed 12 days ago. When we brought them home from the shelter, we discovered they were infested with fleas. Are we able to give them a flea bath before the stitches come out? I would not give them a bath at all. Just get a flea comb and go over their fur with it. If they had not had stitches I would have bathed them in dawn. Also there is a shot you can give them that kills fleas in 24 hours you can get from the vet. First, treat your pets. Check with your vet, but Frontline or Advantage seem to work for most people. It's not dirt cheap, but it's worth it in the long run. Next, treat the environment-the yard and the house. Here's a great website that tells you everything you need to know about do-it-yourself outdoor flea control. It's http://www.pestproducts.com. It was incredibly helpful for us when we found ourselves in similar circumstances. Borax Laundry Booster is great for indoors and is cheap. But it takes a little time to get rid of all fleas, eggs and larvae. Check the threads for that. You sprinkle it on carpets and upholstery, then cover with sheets and towels. Leave on for 2 or 3 weeks if you can stand it, washing the towels and sheets every couple of days as the flea eggs will fall off your pets. If you can't stand 3 weeks, just make sure you vacuum every single day for 3 weeks, until all eggs have hatched from your carpet, then seal up the bag and throw it away each day. Some suggest cutting up flea collars and putting that in your bag, but I haven't tried it. Might work and save money on bags. I know it's miserable, and unfortunately you will have to spend some money, but it is possible to get rid of the little demons! Good luck! We have had fleas this summer for the first time. I have been treating my cats for 3-4 months, but they still have fleas. I have used a few different kinds of drops on the cats. We are now getting them on us and all over the house. I have been using diatomaceous earth on the carpets and dusting the cats with it and dusting the yard, but we still have fleas! We have been using apple cider vinegar and Dawn dish soap and still have fleas. I have bombed the house and we still have fleas. I feel like we have done everything and nothing has helped! Please any suggestions. I am so itchy. Please help. Don't waste your money on expensive bombs. Salt sprinkles on your floors, esp' carpeting, will kill them in about 12 hours. Here is a link. Brewers Yeast is a great way to keep your cats and dogs flea free. The yeast makes the blood taste funny so they don't stay. You can get it at Walmart for about 3.42 for 100 tablets. You can also put a pie tin of warm water with a few drops of liquid dish soap in it to break up the surface adhesion under a heat lamp or even a regular lamp. They love the water and will jump in and drown. I have been looking into the borax mixed with water spray for the yard, and there is one more ingredient that goes in it. It dries up the animal's exoskeleton or else it does something to their nerves and kills the flea. I know borax, the Twenty Mule Team kind in the laundry section kills fleas, but is toxic probably to pets. I am going to use this spray around the fence and at places they normally are not. Be sure not to confuse borax, the laundry kind, with boric acid which is deadly to animals. Bathe them in Dawn and peroxide mixed together in your hand and lathered on them and left to sit for a few minutes. Rinse off. I use a flea comb on them all the time. I sprinkle salt everywhere I have seen them hopping and under fitted blankets, and on carpets, etc. I have been researching coconut oil and I am going to try adding some of this to our bathing. I will let the readers know how it works out. It is supposed to be very good at killing lice when used on the hair. I can't eat coconut oil because of my hypertension, but I can use it topically to get rid of things to do with skin problems, dry hair, and use as a lice treatment during lice season. I just submitted the recipe for a floor spray for fleas to Thrftyfun. Here is what I would do it I were you. Buy a bottle of 3 percent peroxide or even better 1 percent peroxide. Get a box of 20 Mule Team Borax at the laundry aisle at Walmart and then put three heaping tablespoons of borax into the two cups of diluted down to 1 percent peroxide and mix. Put in a spray bottle or pour on the floor and mop with this. I would also put it at the borders around your fence and house, against the foundation and inside along walls, etc. Also, I would spray underneath where the dog lays, and also do his laundry in borax and detergent. I am always going over my carpet with a vacuum. Put a small flea collar in the bag of the vacuum cut up in small pieces or whole either one, also cap the hose with plastic so they can't get out, also store the vacuum where they can't re-infest the house. Vacuum every day for a couple of months and it should help. I do use Advantage on my animals, but it doesn't do anything about the yard or carpets, etc. Also I am researching coconut oil's benefits on the internet for flea control and skin problems in dogs.